Caldey View near Stepaside, Saundersfoot, Pembrokeshire sleeps 6 people. Caldey View near Stepaside has sublime views; set in the rolling Pembrokeshire countryside, this semi-detached cottage is conveniently located in Stepaside, a quaint hamlet, just a short walk from the coastal village of Wisemans Bridge where you can enjoy a stroll on the beach, and some home cooking and a local ale in the inn. 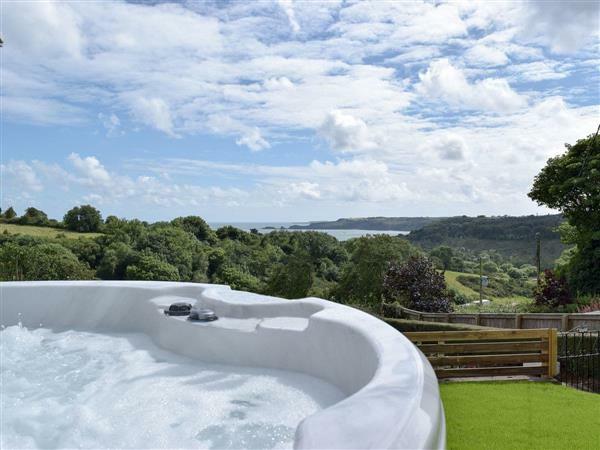 To relax those aching muscles after a busy day sightseeing, you can retire to your very own private hot tub with unobstructed sea views over Saundersfoot Bay, Monkstone Point and Caldey Island watching the sun drop on those balmy summer days and observing the many stars overhead. Caldey View has been thoughtfully furnished throughout, and finished to a very good standard. It has spacious, open plan living, dining and kitchen areas featuring a double-sided wood burner, and the galley style kitchen is the perfect place to prepare those special occasion meals with your family, or you can opt to dine al fresco to take in the sea air. The bi-fold doors almost bring the outside indoors, and the raised decking offers a fantastic entertaining space, leading down to the garden which has magnificent sea views. Within a 10-minute walk you can be rambling on the coastal path through Wisemans Bridge and on to the harbour town of Saundersfoot, where you can enjoy a host of restaurants specialising in local produce and hand-caught fish, or fresh fish and chips on the harbour wall. A 10-minute drive from Caldey View brings you to the sandy beaches in Tenby, and nearby you can enjoy quad biking, fishing, golf, boat trips and a host of wildlife along this ‘picture postcard’ coastline. The beach is 1 mile from Caldey View near Stepaside. With the shop 2 miles, and the pub & restaurant are 1 mile from Caldey View. Ground Floor: 11 steps to entrance. Caldey View near Stepaside is all on the ground floor. Living area: With wood burner, 40 Freeview TV, DVD player and bi-fold doors leading to decked area. Kitchen area: Galley style with electric oven, induction hob, microwave, fridge and dishwasher. Gas central heating, electricity, bed linen, towels and Wi-Fi included. Initial logs for wood burner included. Travel cot and highchair available on request. Welcome pack. Enclosed lawned garden with decked area, garden furniture and barbeque. Private parking for 2 cars. Hot tub for 5 (private) with shower facility. No smoking. Holidays at Caldey View run from Friday to Friday. Pets allowed at Caldey View. For a better idea of where Caldey View is, you can see Caldey View on the map below. Caldey View is in Dyfed; should you be on the lookout for a special offer, you can find all the special offers in Dyfed. It's always worth checking to see what is on offer at the moment. Do you want to holiday near Caldey View (UK6387), you can see other cottages within 25 miles of Caldey View; have a look to find your perfect holiday location.